Australian brand sweeps the board winning five prestigious UK beauty awards! Adding to a growing list of high profile industry and media accolades, these most recent awards further strengthen the position of (A'kin)and (Al'chemy) as leaders in the natural hair, body and skin care category. The winning products include some of the (A'kin) and (Al'chemy) 'heroes' and prove that high quality natural products can be both effective and affordable. Best-seller (A'kin) Pure Radiance Rosehip Oil uses only the highly concentrated rosa canina seeds as its source. The result is an oil that is rich in high concentration of bio-available vitamin A and E and omega 9,3 and 6 essential fatty acids. The effectiveness of this certified organic rosehip oil is further enhanced through its supercritical extraction method. This method uses low temperatures to retain the rosehip[/'s optimum benefits. Skin will be comforted, deeply moisturised, look vibrant, youthful, feeling smooth and soft. Testers say- "my complexion looked really luminous, as if I had slept for a week; skin plumped, soft and younger; even my crow's feet not so noticeable." This light cleanser is ideal to use on even the most sensitive skin and is enriched with certified organic Australian avocado oil and shea butter together with olive squalane. It gently removes face and eye makeup whilst the witch hazel mildly tones the skin. Testers say- "I loved this wonderful-smelling product; it's the best cream cleaners I've tried and all natural; a definite improvement in the texture and smoothness of my skin." A nourishing rapidly absorbed, unscented eye night cream in a time release system with powerful ingredients such as gingko biloba, vitamin E, alpha lipoic acid, omega essential fatty acids 9,3 and 6. It works while you are relaxed and asleep to help regenerate the tissue and improve microcirculation around the fragile eye area. Testers say- "reduction in puffiness and fine lines smoothed". 30 minute vitamin masque to restore moisture for all hair types. Richly nourishing and protecting ingredients include Australian jojoba oil and certified organic avocado oil combine with ginkgo and white tea, vitamins E and B5, rice amino acids and wheat protein to help restore hair moisture, flexibility, strength and colour. Testers say- "massive improvement; my mad, crazy, bushy hair looked... wonderful!" 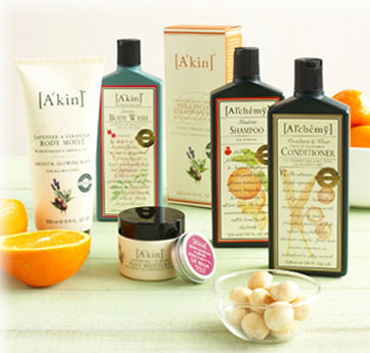 (A'kin) Unscented Intensive Hand, Nail and Cuticle Treatment- WINNER The Green Beauty Bible Awards 2009. A rapidly absorbed hand crème made with healing vitamin E and B5 together with moisturising certified organic shea butter and cold pressed jojoba oil. Perfect to use on hands that have suffered trauma such as sunburn and skin disorders such as allergies, eczema and dermatitis. Testers say- "Very good for tackling dryness, my hands were cracked and it sorted them out immediately; also fixed my ragged cuticles and helped smooth out hangnails." Beauty Bible Steals features hundreds of fabulous beauty bargains- cosmetics, skincare, hair products- tired and tested by real women and written by renowned beauty experts Sarah Stacey and Josephine Fairley. Compiled and edited by Josephine Fairley and Sarah Stacey, with results based on the opinions now of over 7,500 women over a period of 13 years, this is unquestionably one of the biggest consumer tests of beauty products carried out in the world.